How fear influences our decisions and choices: in personal behavior and/or societal fear. Recognizing and transforming/overcoming it in relation to firearms. So now I have a name for the terror that used to grip me at the thought of picking up a gun (and sometimes still unsettles me when handling sharp blades). At first I was a wee bit giddy with what approached delight having found a label for it, but my fervor was dampened as I continued wading into the subject. I soon was floundering in the “deep end” of politically slanted rhetoric and pseudo intellectualism. Many of the articles implied that anyone who disagreed with the “2nd amendment” – er’s position must be emotionally disabled or ill. I have addressed the tendency we have to dehumanize people so that we can act with impunity in ways that may be cruel and demeaning in my post “Pride and Prejudice.” I find it disturbing that both sides are attempting to make positions on guns a mental health issue, rather than keeping it in its correct place as our Constitutional Right. I hope this word will not experience a popular resurgence. After today’s wandering through the internet on the subject, I conclude citing and sharing sources of what I uncovered there would be of little value. What emerged and was clearly evident in what I read, is an undeniable climate of FEAR about fire arms, both on a primitive level (a “true phobia” ) or the generalized level (a social phenomenon). Also interesting to me is that “both sides” were in favor of desensitization for the person labeled hoplophobe. 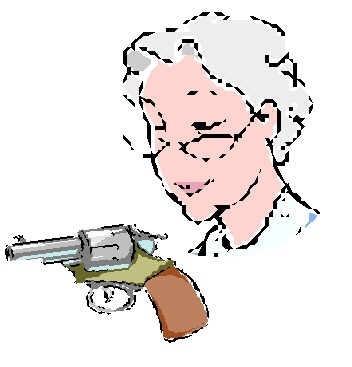 The methods varied from showing pictures of guns and firearms to the “patient,” or undergoing neural conditioning/hypnotherapy and/or taking drugs to reduce anxiety, to having the person study and take a course at a range to learn more about the focus of their fear – firearms. I believe great CAUTION is necessary in applying words like “hoplophobia” randomly or because you don’t agree with someone else’s position. Labeling and what amounts to name calling your “opponent” (by either “side”) does nothing to reduce the widening gap in this heated arena. Keeping FEAR embedded in your life, and projecting that out onto others who may disagree with you, will keep you – and them- trapped in a vicious downward spiral. What will help is being a responsible, respectful advocate for gun ownership. If you have overcome your FEAR – hoplophobic or otherwise – share that with others in a positive manner. As you have taken steps in transforming that negative paralyzing state through knowledge and understanding, you have allowed yourself, and hopefully others, to move forward with empowerment. How do you choose your first firearm? This is a continuation of the January 13th post: Are you thinking of buying/ carrying a gun? In that post I shared my opinion that a decision to own/carry a gun should NEVER be acted on from a “knee jerk” reaction to something that has happened to you, someone you know, or someone you have read or heard about. Fear, while a strong motivating force that may have helped you make your decision, must be “laid aside” and careful and critical thinking needs to be applied before acting on your decision. Owning and carrying a gun is a serious matter and needs to be given appropriate respect and consideration. Like other important decisions in life there are some basic factors to consider as you begin the process of becoming an empowered, responsible gun owner. Today’s post suggests a way to help you get started on that journey. There is a lot of information published on the subject of “choosing the right gun,” and I will add some links that may be of assistance at the end of this post. In my husband’s NRA Basic Pistol classes, I have seen quite a few women carrying around very nice firearms they are not comfortable with and/or have not been able to control or operate safely and effectively. Typically they have been provided/advised to get “w-a-y too much gun” by a well meaning husband, male relative or salesmen. While you wouldn’t dream of walking up to a salesperson and blindly letting them pick out a purse or pair of shoes for you, a large number of first time (and particularly mature) gun owners want or expect someone else to make this very important and personal choice for them. In this strange new world of firearms, most often “you” don’t have a clue about what “you” need. The very first step – before approaching someone to help you pick out a firearm- is realizing it is your responsibility to think through what your needs and abilities are FIRST. A salesman at the gun counter can be very helpful, as can your husband, friends, firearms instructor, internet articles and magazines. But basically it all needs to start with you understanding what “YOU” need. The first and MAIN factor in choosing your first – or fiftieth – gun is: what will be the purpose of the gun? You need to think about your life situation, the neighborhood you live in, where you go when you leave your home, and the situations you are likely to encounter. A) Carry a firearm with you outside your home? B) Maintain a firearm primarily to protect yourself in your home? C) Both A and B? Once you have made that determination, it is time to do some homework! You will need to research the different types of firearms best suited to your basic situational need. Afterall, once you remove the “fear factor” attached to guns, the purchase of a firearm is really no different than purchasing any other personal and/or major item. As women we have honed that skill. Take some time to reduce the “mystery” of this subject, to learn the “language” and you will start to gain confidence and be a much more savvy shopper! Remember to take into account your lifestyle: your choice may be very different if you drive your own vehicle or ride on public transit; do you live in shared quarters? an apartment? a house in the suburbs? or in a rural setting? What are your physical abilities? What type of firearm would fit you best for your size, and if you have decreased hand strength, mobility or vision issues? After taking an inventory of your situation, needs, strengths and limitations, and familiarizing yourself with some of your options, you will find yourself a bit more “grounded” and ready to begin your active quest to choosing your first firearm. Don’t rush it. Guns are a major investment, and ridding yourself of obvious and hidden fear factors- by gaining information – is a solid first step. As you continue on this journey, you may learn that one firearm cannot fit all your needs. That lightweight gun to carry with you will undoubtedly have more recoil to contend with than you want for target practice, but the heavier practice gun will not travel well with you. Depending on where you live, you may be able to rent a firearm for practice. You may determine that a shotgun may be the safest and best choice for your home defense need. Ultimately, only you can decide which “need” is the greatest, and make the decision on what will be YOUR best first purchase. Quite a few of the older women in the classes are on fixed incomes, and money can be in short supply. Past the initial purchase, there is ammunition, cleaning supplies, accessories to carry/store the firearm, range and training costs. The decision to purchase a firearm is an investment.That will be the subject of another post…. until then….